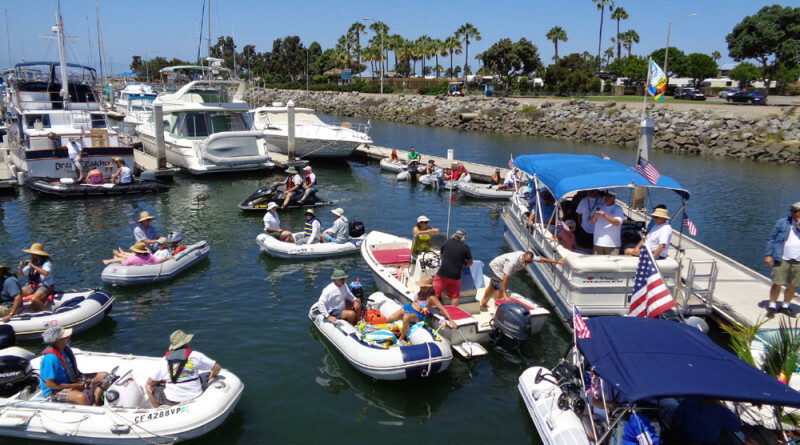 CHULA VISTA – More than 44 boats and dinghies traversed the South Bay in a race to reach seven specified locations Aug. 8 as marina tenants embarked on a mission to get the best card hand during Chula Vista Marina’s fourth annual Small Boat and Dinghy Poker Run. Participants made stops at Calypso Café, Loews Crown Isle Marine, Fiddlers Cove Marina, and Seaforth Glorietta Bay, Pier 32, Crown Cove Aquatic Center and Bill of Rights, which is moored at the marina’s excursion dock. Up for grabs were several prizes provided by local vendors, including haul outs from Marine Group, Shelter Island Boat Yard, and ielsen Beaumont, an annual tow package from Sea Tow, gift certificates from the Dinghy Doctor, CFB Marine Group, Galley at the Marina, Bali Hai, Mission Brewery, JP Motor Sports, Down Wind Marine, Sailing Supply, Marine Exchange and Sea Breeze Books and Charts. The party continued back at the docks at the 5 O’clock Somewhere party which was free to all Chula Vista Marina tenants with music provided by Mark Wood and the Parrot Head Band. Top winners were: Chris Lisle; Coula Ringgold; Chris Raynor; Will Wagner, and Jim Goodwin.